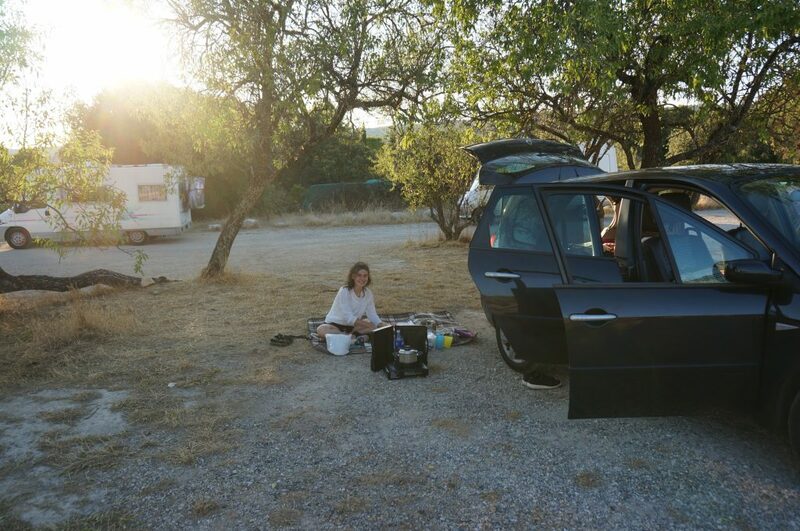 If you also happen to travel (and sleep) in your car, or in a RV, and look for some great, safe and still lovely spots along the way to spend the night, Livron-Sur Drôme is a tiny village we made our way through and found a remote parking lot with lots of trees up a hill. In the morning we woke up with a beautiful view. 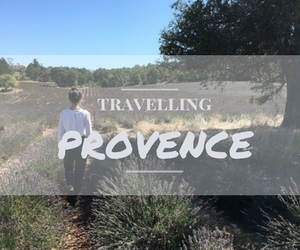 Also, if you keep driving towards Orange, you will come through a town called Donzère which provides free parking spots, a restroom and even a fruit, veggie and a snack truck where you can spend the night with other travellers for free. From way up on the top we saw a remote parking lot right next to a forest, some kind of park and a river. Below the city turning into pré des arbres is where we spent the night. Heading down from Les Baux-de-Provence on the street D27a, right outside the city boarders and a few hundred meters before turning onto D5, there is a lane on the left side with a sign saying “automobile parking”. Way off the road, passed some olive fields an empty parking lot appeared that revealed an amazing view of the city. We just happened to arrive during the perfect time and the evening sun turned the whole surrounding into a golden country. 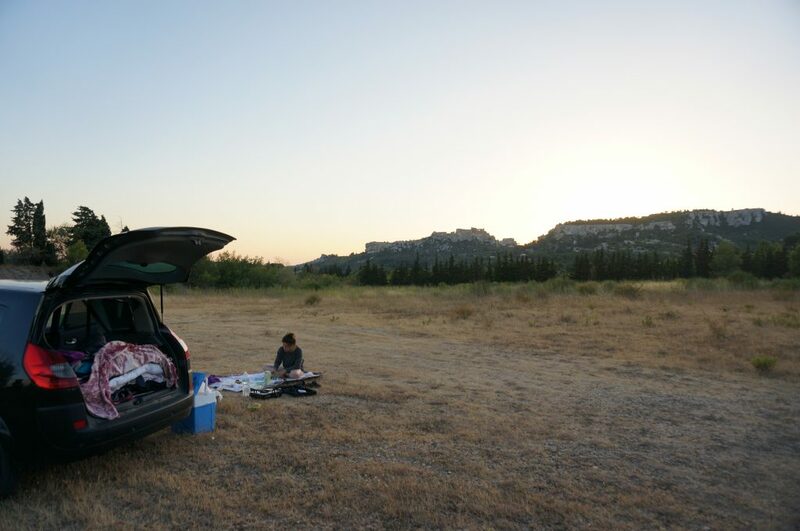 This place got everything we want in a spot for the night – from being quiet and remote, way out in nature, to a place with a beautiful scenery and view – this has been our favorite! Following D5 towards the city Saint-Rémy-de-Provence, up the mini serpentine like streets and right on top of the Alpilles there is another parking lot on right side of the street. From other campers/hikers/car sleepers I know that they stayed at this place for even more than one night. 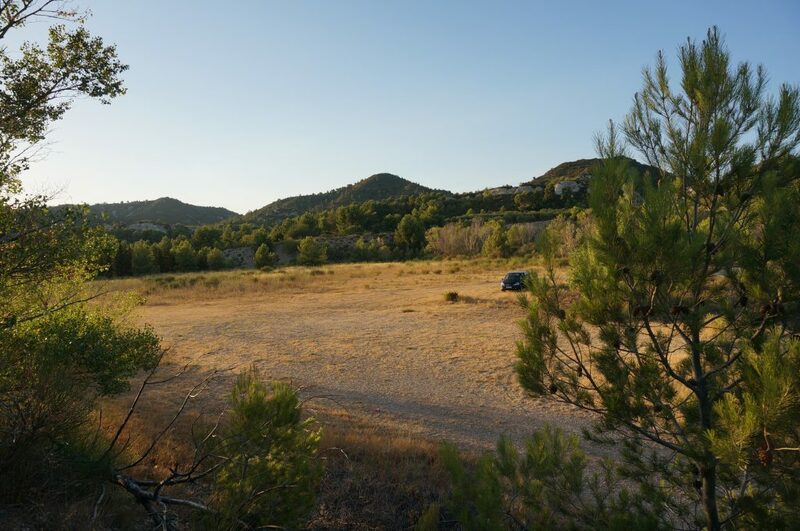 Being right in between a beautiful forest with pic nic areas, the starting point of many hiking trails and signposted on the street so that there are always a few other campers and you will never be alone, I can see why this place is very attractive to fellow campers. This night was the first night it really took us quite a while to find a great spot for the night. 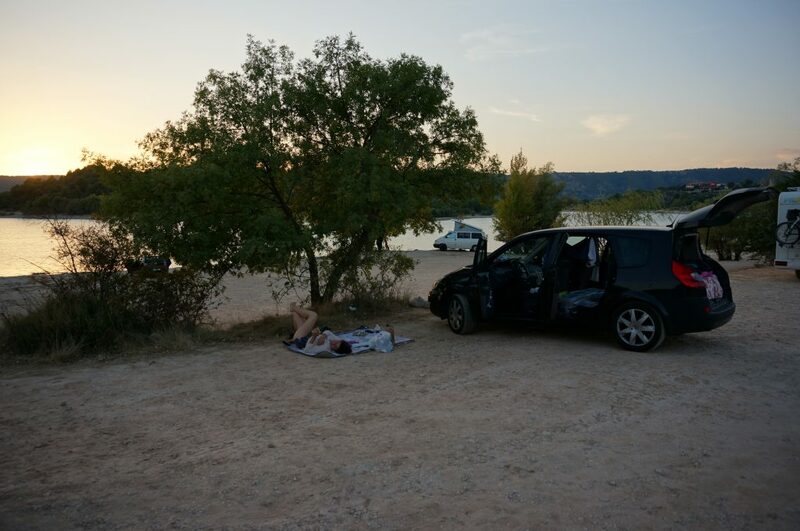 In some parts of the areas we drove through there is one perfect sleeping spot after the other, but this evening it got later and later and we didn’t pass anything that seemed good enough – maybe we should lower our expectations haha! Anyway, we eventually drove through a town called Mirabeau. As we couldn’t find anything to park the car outside a city, we decided to try find a church or town hall parking area. Mirabeau is the craziest tiny town with the littlest streets I ever made my way through. Just wide enough to fit through with the car, they even placed chairs to the right and left of the street. People sitting there had to get up for us to continue to drive – there probably passes 3 cars per day. I was a little lucky girl not being the one driving hehe! By accident – as we kinda were stuck in this town with only one way streets – we came right by a playground with a huge lane no one uses. And voila, there we found another beautiful spot for the night! On day 7 I woke up feeling terrible. The last few days I have already been really exhausted and feeling weak, and must have caught and developed some not so pretty flu overnight.. 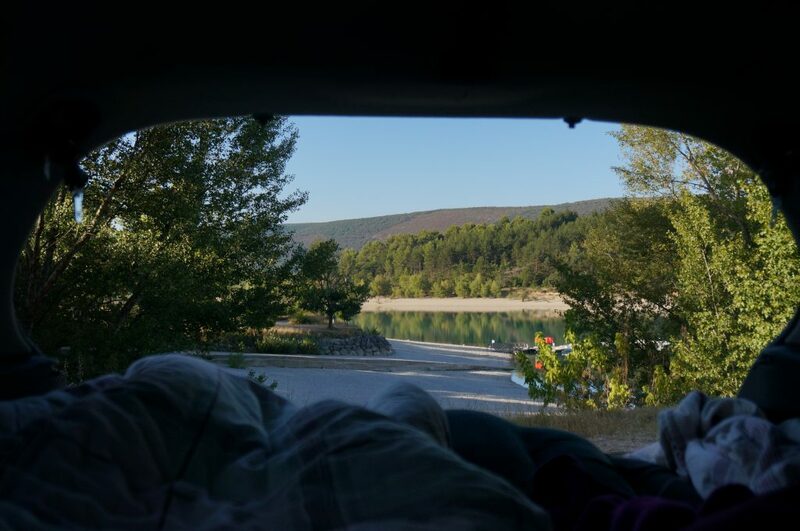 But after we finished our whole day tour around Gorges du Verdon, we gladly enjoyed the evening hours at the shore of the lake Lac de Sainte-Croix, with it’s magical turquoise water. With the sun settling right above the water we even had a great view till the very last minute of this day. From there we took on the route up north and slowly began out way back home – so crazy how fast time is flying by and suddenly 10 days are over! 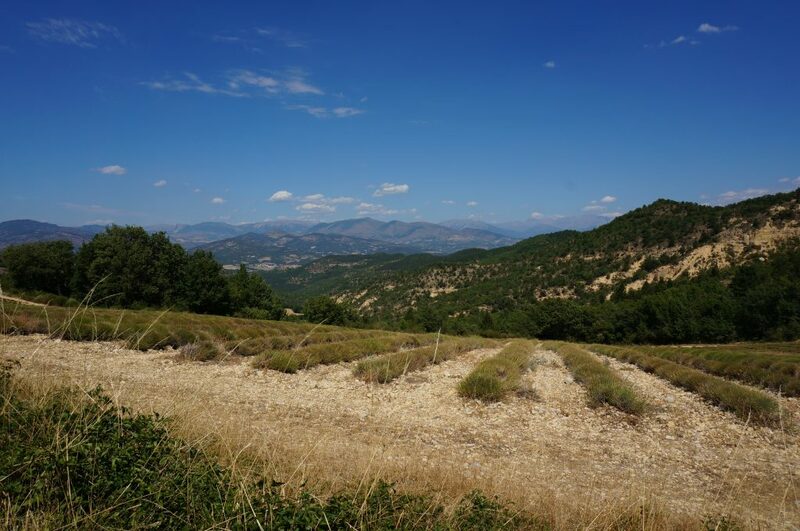 We decided to hit the road D8 from Moustiers-Sainte-Marie towards Château Amoux Saint Auban which was a full catch of success. With its super narrow street, taking us right through nature and no soul in sight, plus a stunning view all the way to the Swiss Alps, this has been like a free sightseeing tour. Pretty soon the scenery looks pretty different. It is really hard to tell what exactly it is, but it just does.. Maybe it is the ever changing landscape of trees, mountains, much green, little green, hills, lots of clouds and sometimes grey lonely villages. Being used to all the beauty of the south (I mean we still were in the south, but it felt more like the north already hehe) it was really challenging for nature to satisfy our high expectations of great sleeping spots. 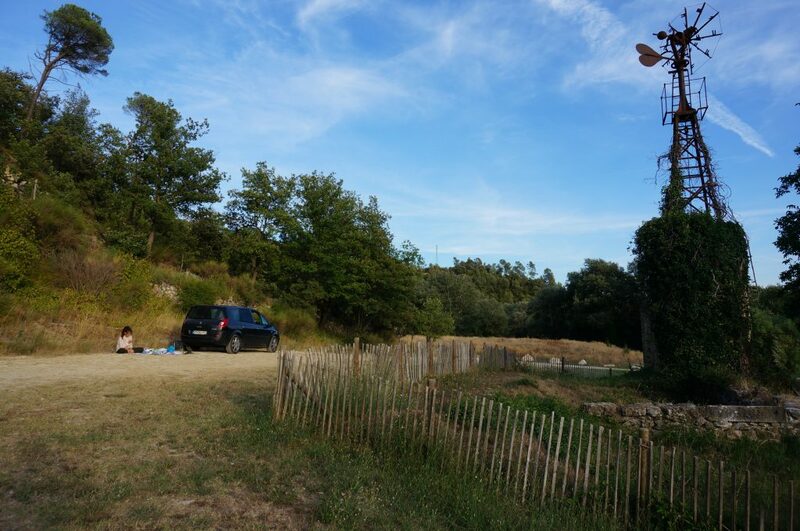 Eventually we found a great parking lot with picnic tables right in the middle of a forest. But as soon as it got dark it got reeeeeaaaaally scary in there, and I begged to continue driving haha – I get scared sooo easily! Even though the town itself was not as beautiful as the ones we visited the last days, it got lots of fountains, the typical great structure with narrow alleyways, market places, a church right by the town hall aaaand just as if it all was planned, a live concert right besides our sleeping spot began shortly after we had arrived. 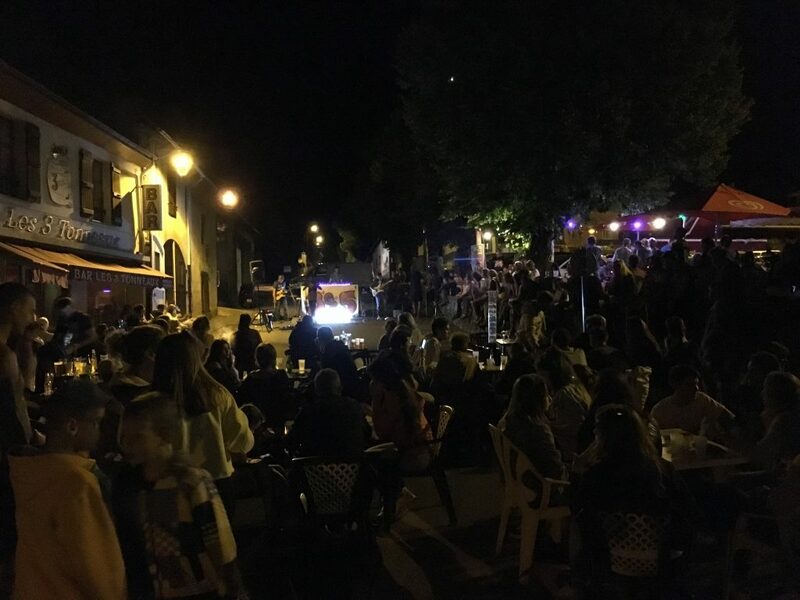 The band 3 grammes 5 had that night a live show in the streets of the town; and we happened to be exactly that day at that time at that place, to enjoy their funky reggae music – what a coincidence! 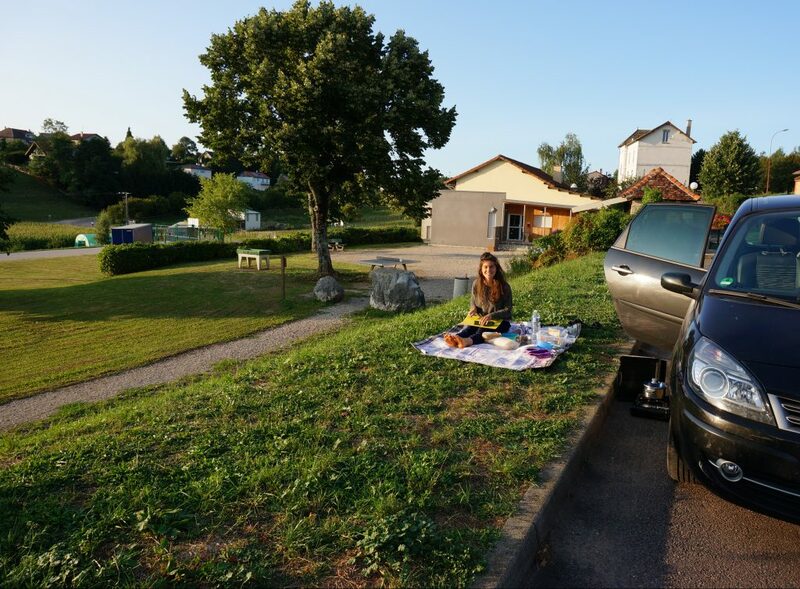 So answering the question how possibly a spot should get any better than one right by a beautiful lake – well maybe with a “personal” live concert with great music right next to your car? From there we made our way further up north and back home. 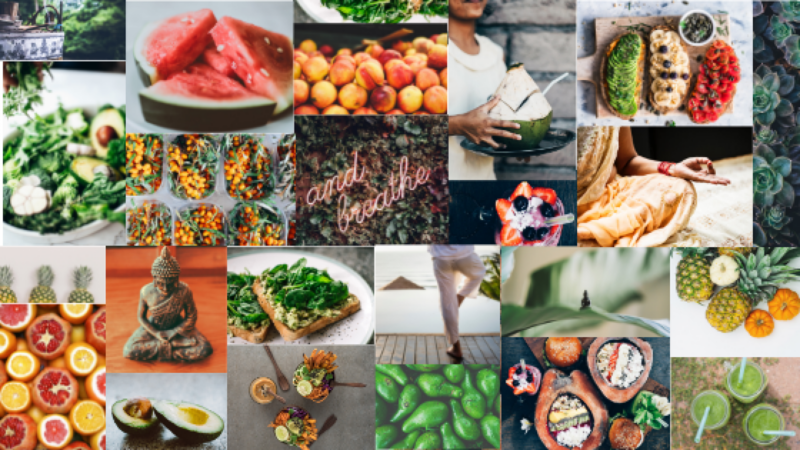 Here I put together all of the best impressions and pictures from our travels – such magical moments. I hope you enjoy them!